PartyPoker is available on iPhone, iPad and Android. Play Texas Hold'em ring games for cash or in play mode. 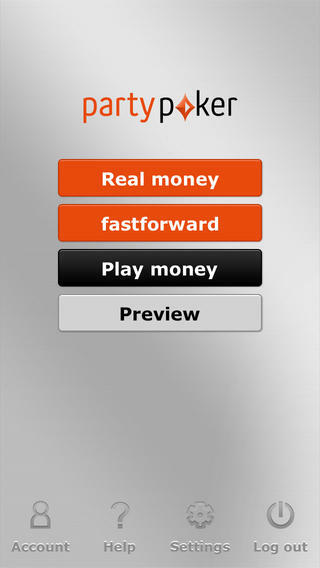 Play "Fastforward" speed poker on your mobile device. Join one of the world's oldest and largest poker networks. ​Sit & Go tournaments are now also available via the app. Party Poker is one of the few online poker rooms that should require no introduction, as the site helped shape the online gambling industry and set the standards for all the other networks to follow. Consequently, many people were rather disappointed by the lack of Party-branded mobile products. 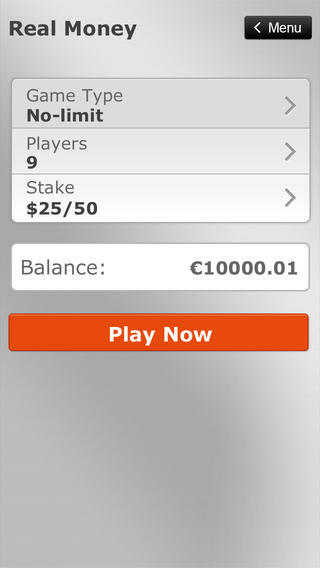 Fortunately, with the new Party Poker Android app, all Android smartphone users now have a chance to join one of the largest player pools in the world and enjoy the site’s unique take on Texas Hold’em while remaining on the go. The new Android app will work any any Android handset, including Sony Xperia, LG, Motorola and Samsung Galaxy and is available for free on the Party Poker website – consequently, setting it up on your device is as simple as visiting the mobile section and clicking the download link. Unlike the iOS version, the Android software isn’t region-locked, which means that you should be able to complete the setup process even if your country hasn’t regulated real money online gaming yet. However, you should keep in mind that Party Poker isn’t a US-facing site, which means that US-based customers won’t be able to join the action even if they install the necessary software. As you’d expect, playing on Party Poker requires you to have an on-site account. Fortunately, the registration process is very simple – all you have to do is provide the Party Poker staff with basic personal information and a valid e-mail address. Please note that the app doesn’t have any cashier functionality, which means that you won’t be able to transfer any money without using your desktop computer. This omission is somewhat compensated by a rather lucrative $50 welcome promotion, which is a 1:1 match on your first deposit. As is often the case, the money won’t be credited to your account instantly – instead, the bonus funds will be released in $1 increments as you play on the site. 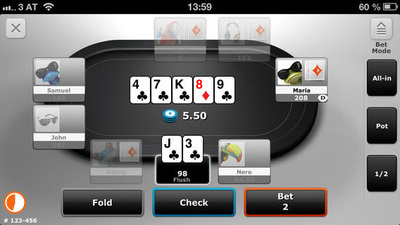 The interface of the new Party Poker Android app is well designed and matches the updated layout of the site, so the classic green and white theme has been replaced by a mix of silver, white and orange elements which have been designed specifically with the limited screen real estate of a modern smartphone in mind. The menus are easy to navigate and intuitive, which means that even if you haven’t used a mobile poker client before you shouldn’t have any problems with adjusting to the new interface. Even better, the app comes with a short video guide that demonstrates the basic features of the table mode, which can be accessed directly from the lobby. Other than that, the main menu allows you to choose between playing for fun, playing for real money and adjusting some basic table mode settings. The available customization options are rather limited, but fortunately the app allows you to replace the traditional two-colored deck with a modernized four-colored one. Texas Hold’em is currently the only poker variant supported by the Party Poker Android app, which might disappoint fans of Pot Limit Omaha or Seven Card Stud. 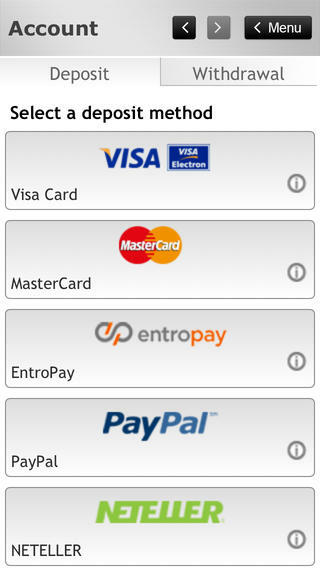 Sit & Go tournaments have been added in a recent upgrade of their mobile software. The app supports medium, low and micro stakes, but keep in mind that high-roller action on Party Poker remains available exclusively to desktop-based players. On a brighter note, the new client allows you to choose between full ring, short-handed and heads-up play or even try Party’s unique brand of fast-fold poker, which has been dubbed Fast Forward Poker. This means that the new Party Poker app is best suited for players who enjoy the adrenaline-pumping fast-fold action and grinders who value the ability to play countless hands per hour without having to go through the trouble of playing on multiple tables at once. Furthermore, it is worth pointing out that while the app doesn’t really offer anything new in terms of game selection, there’s simply no denying the fact that it delivers some of the smoothest Hold’em cash game action available on the market these days. The table mode is the heart and soul of the new Party Poker Android app - as you’d expect from a cash game app, the visual elements have been designed with maximum functionality in mind, which means that you won’t find any flaring special effects to distract you from the action here. The buttons and fonts are large enough to be easy to read even from a considerable distance, which is particularly useful in Fast Forward mode. Even better, every player is represented by a unique avatar, which allows you to quickly assess your situation whenever you’re transferred to another table. As briefly touched on above, Party Poker is a part of a massive, high-traffic network, which means that the competition can get rather tough even at the medium stakes. Fortunately, the micros and low stakes are still fairly beginner-friendly, which means that you don’t really have to be a poker veteran to enjoy yourself at this site. In addition, the size of the Texas Hold’em player pool on Party Poker means that finding a full game isn’t going to be an issue regardless of the time of the day and the stakes you choose, so unlike in the case of smaller networks, you’d be very unlucky to find yourself wandering aimlessly from one empty table to another. The Party Poker Android app will impress players impress most Samsung Galaxy, HTC and Sony Xperia users. The user interface and overall table mode functionality is pretty much spot-on as long as you don’t mind the lack of advanced customization options, the action is smooth and fast-paced and the tables are packed with players from all over the world. All things considered, if you don’t mind having to deal with flaws that plague many similar Android-based poker clients, Party Poker is pretty much guaranteed to deliver a satisfying Hold’em and Sit N Go tournament experience with a nice welcome bonus to sweeten the deal.